If you offer many products or specialize in certain target groups (e.g. kids), then the template feature can be a real time saver. 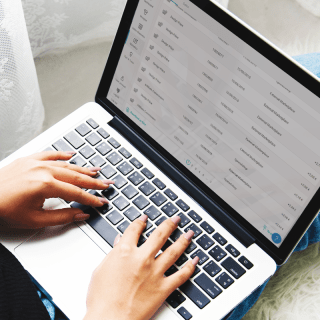 Recurring work steps are now carried out more quickly: Selecting products and colors, as well as determining the size and position of your design on the product, are easily completed with a single click. 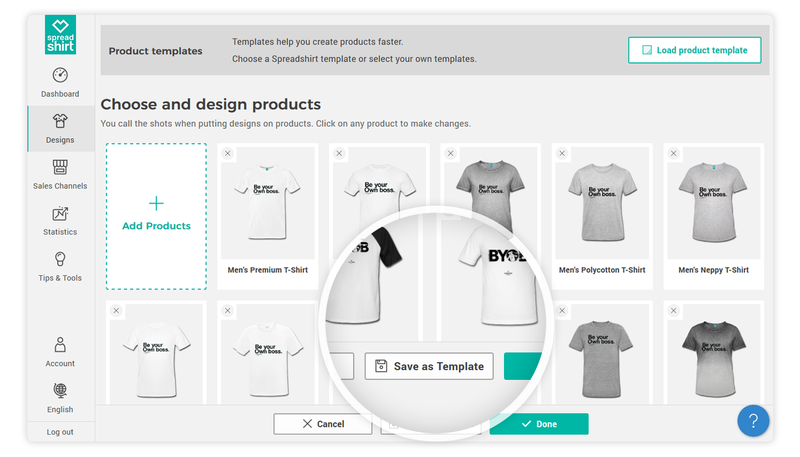 A template helps you create a whole kids’ collection with your design, including bodysuits, T-shirts and hoodie. Moreover, certain color combinations can be deactivated – for one or several products. 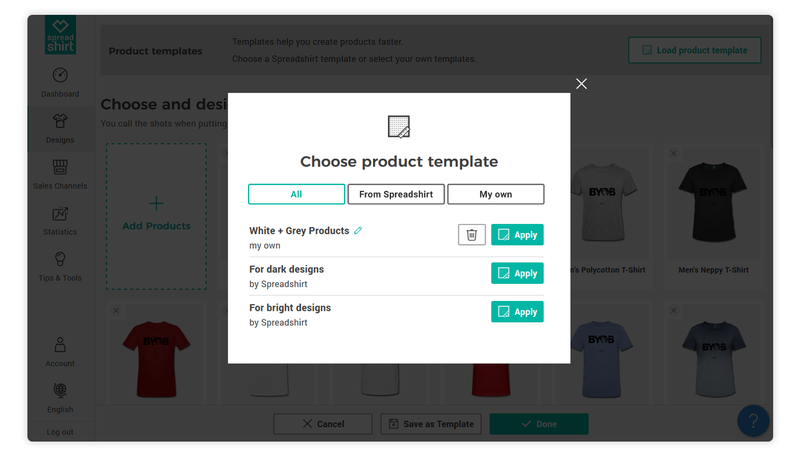 This way, you can prevent dark designs from being ordered on dark product. Click on the “Select template” button. 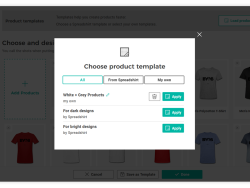 Click on “Apply” to select a template. 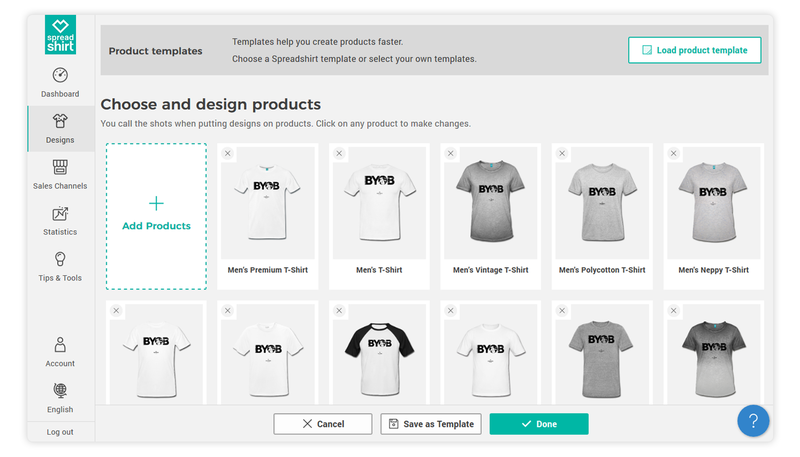 In addition to Spreadshirt’s pre-set templates (for particularly dark or light designs), you can create your own templates and save a total of up to 10 templates. 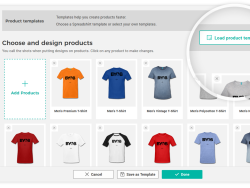 Add your desired product types and edit position and size of your designs. Click on “Save as template”. Find a suitable name for your template (max. 35 characters). You can now use it for other designs. 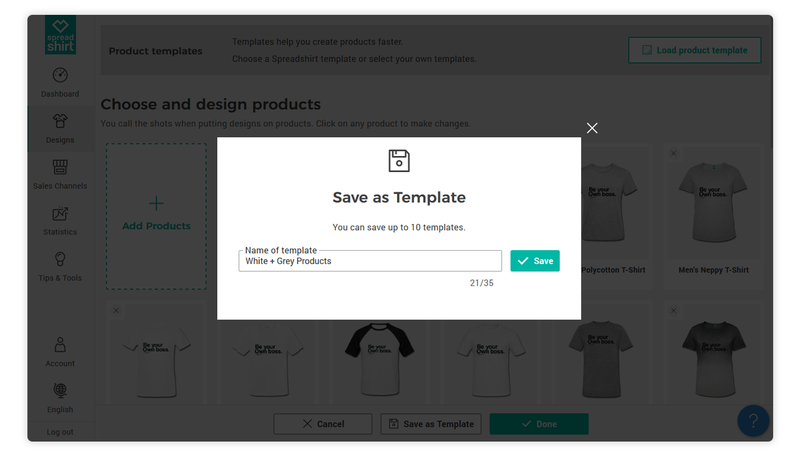 When you edit a template and save it using “Replace”, designs with this template will remain unaffected by the changes you make. 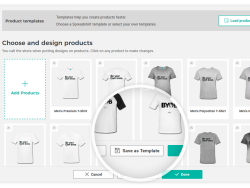 Also, keep an eye out for new products, because these are not automatically added to the templates – even if you have selected all products from the category (e.g. “Kids & Babies”). If you change the color of your vector graphics when editing products, these changes won’t be saved in your templates. These changes need to be made manually in the affected templates. Designs that are suitable for poster printing are automatically recognized by our system as posters based on their file properties. But since the template function can unfortunately not be applied to poster printing, you won’t be able to create a template based on poster designs. 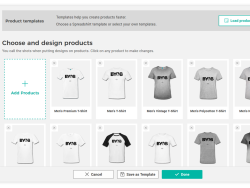 Of course, you can use your design on other products and apply it to templates that you already created. 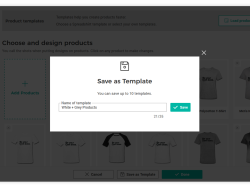 The template feature is available to all users of the Partner Area. Do you like this feature? Try it out and let us know what you think! My partner area looks nothing like this and apparently templates aren’t available to me? Freakin Fantastically Awesome!!! 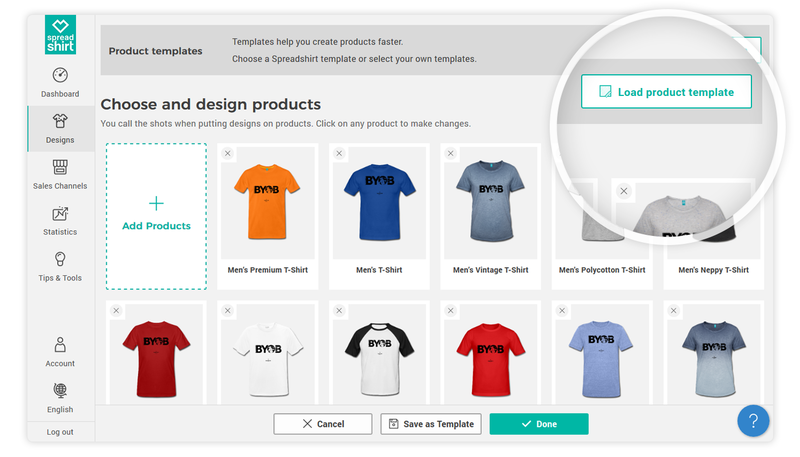 The product templates feature is exceptional, making the process so, SO much easier & quicker, I LOVE it! If I may suggest, another feature I think would be great would be if sellers could send personal thank you notes to buyers, via Spreadshirt. 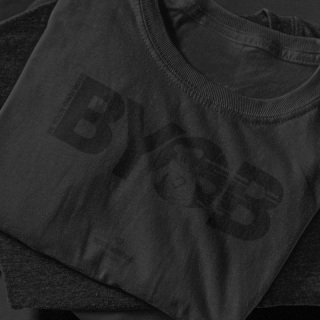 I believe that would help develop relationship w/ customers & result in repeat customers. 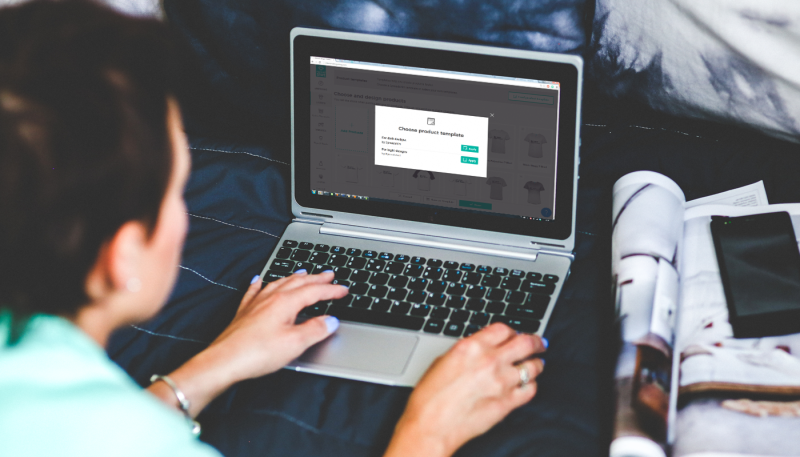 Sending them via Spreadshirt would keep the customers’ privacy. A breeze indeed. We’re very happy to hear you find this feature so helpful.